CC is by far the most widespread Open Content licencing model. Its popularity and widespread use means CC can nowadays be considered de facto as the standard for Open Content licencing. In order to meet the varying needs of different publishing strategies, CC provides a set of six licences and two public domain tools. Each licence contains one or more of four basic elements (the “licence features”) which are illustrated by abbreviations and pictograms. “BY” stands for attribution (the obligation to credit the author and other parties designated for attribution); “NC” stands for NonCommercial (commercial use is excluded from the licence grant); “ND” means NoDerivatives (only verbatim copies of the work can be shared) and “SA” represents ShareAlike (i.e. the work can be modified and modified versions can be published but only under the original or a compatible licence). The most permissive licence is CC BY. It grants unrestricted, irrevocable, royalty-free, worldwide, indefinite rights to use the work in any way, by any user and for any purpose. The only requirement is that the user credits the author and other parties designated to receive attribution and retains copyright and licence notices. All other licence versions contain further restrictions. The most restrictive licence is the CC BY-NC-ND. It allows neither modifications nor commercial use. This section gives a brief overview over the different CC licence types. The different licence features, restrictions and obligations are further explained in more detail in section 3.5. The author and other parties designated to receive attribution must be named in the manner requested by the licenser as long as the requested form of attribution is reasonable. If supplied by the licenser, copyright notices, a reference to the CC licence (preferably as a link to the CC website), a notice that refers to the disclaimer of warranty and liability and a link to the original source must be retained. If the work is shared in an adapted version, it must be indicated that it is a modified version. Former indications to modifications must be retained (section 3.a.1.B of the legal code). If the licenser requests to remove any of the information referred to in paragraph 2 above, the user has to do so as long as it is reasonable. The licensee must not create the impression that their use is in any way endorsed by the licenser or any party designated to receive attribution (section 2.a.6 of the legal code). As the general licence of Wikipedia, CC BY-SA is one of the most important and widespread CC licences. Licensers, who would like their content to be uploaded onto Wikipedia, or would like to combine it with Wikipedia content, are advised to use CC BY-SA. The only difference between CC BY-SA and CC BY is the ShareAlike clause in section 3b of the legal code. Under the CC BY licence, anyone who adapts the work can redistribute a modified version under the terms of their choice. CC BY-SA, however, binds the adapter to the terms of the original licence. In other words, adapted versions must be shared under CC BY-SA or a compatible licence. Apart from the above-mentioned duties to indicate the modifications, the adapter’s licence m must comply with the following conditions2. A hyperlink or other reasonable reference to the adapter’s licence must be included. 3. The use of the modified version must not be restricted by additional terms and conditions or TPMs. The CC BY-ND licence does not permit adaptations of the work. To protect its integrity, only verbatim copies may be distributed and shared. The NoDerivatives restriction can lead to significant problems with the combination of different content, e.g. in remixing, sampling or joined publications. Apart from this, the licence terms are the same as in the CC BY licence described above. Contrary to the afore-mentioned licences, the CC BY-NC reserves the right to use the content commercially, i.e. a user is not allowed to reproduce the work or create derivatives if their purpose is to realise a commercial gain. The respective restriction can be found in section 2.a.1 of the legal code. Apart from that, the licence is identical to CC BY and therefore subject to the same obligations. The CC BY-NC-SA combines the NonCommercial and the ShareAlike features. Therefore, the work can be adapted, and adapted versions can be shared under the conditions referred to in paragraph 2 above. However, no commercial use of the licenced material is permitted, neither of the original nor of any modified form. This licence is used, e.g. by the Massachusetts Institute of Technology (MIT) Open Courseware Project (OCW). The CC BY-NC-ND is the most restrictive CC licence. Neither modifications nor commercial uses are permitted. The general obligations mentioned in paragraph 1 above also apply to this licence. As described in the beginning, a right holder retains their copyrights when using an Open Content licence. They merely grant others permission to use the work under certain conditions. As opposed to this, works in the public domain are not (or no longer) subject to copyright protection at all and may be used without restrictions. Hence, no permission – no licence – is needed anymore. To mark works in the public domain, CC offers two tools: The CC0 (No Rights Reserved) declaration to dedicate own works to the public domain and the Public Domain Mark to label works which are already free of protection, e.g. because the term of protection has expired or because they were not protected in the first place. The CC0 is a tool to deliberately dedicate copyright-protected works to the public domain. Thus, it is basically a waiver of rights. Once it is in effect, a work belongs to the public domain and can be used by anyone without any restrictions or obligations. CC0 is nothing but a standardised declaration of such a waiver which can be used by anyone who wishes to dedicate their work to the public domain. The first fall back option is a permissive licence similar to CC BY but without the attribution requirement. Hence, it is a licence without any restriction or obligation. The second fallback option, CC0, is a legal construct usually referred to as a “non-assertion pledge”. It is a legally binding promise of the right holder not to enforce their rights in any way, even if there was a legal option to do so because the waiver and/or licence are not valid. The idea behind the three-tier approach is the following: If the first solution is not effective, the second option comes into effect and if this was ineffective as well, the third option would come into force. In some jurisdictions, certain rights can never be waived or made subject to a blanket licence. In these cases, for example, the second fallback solution comes into play. In contrast to CC0, the Public Domain Mark is not a declaration but rather a label for works which are already in the public domain. This can be the case, for example, once the term of protection of a work expires. Copyrights and authors' rights are granted for a certain amount of time only. In Europe, for instance, the rights terminate 70 years after the author’s death. After this term, the work is considered to be in the public domain and can be used without restriction. The purpose of the Public Domain Mark is to enable anyone to clearly mark works which are no longer under copyright protection. CC provides a tool on its website which generates an HTML code which can be used for public domain content available online. This code is particularly useful because search engines are then able to detect such content on the Internet. Before the Public Domain Mark can be applied to a work, a thorough inquiry about the legal status of the particular work is required. Calculating the exact term of protection can be difficult, especially with regard to the differing rules in different jurisdictions. Tools such as the Europeana Public Domain Calculator may help in this task. Over the years, the CC initiative has constantly developed, modified and modernised its licences. The current version, CC 4.0 (hereinafter referred to as CCPL4 = CC Public Licence version 4), was published on November 26th, 2013. The CC Public Licence Version 3 (CCPL3) and CCPL4 differ in a number of ways, i.e. they contain sometimes subtle, although often important, differences. Legal language as well as regulations differ from country to country. Licences based on US law can thus be partly invalid in other parts of the world. For example, the liability and warranty disclaimer in the original US CC licences are invalid under German, and most likely Pan-European consumer contract law. If a licence clause is invalid, complex questions arise. Such complexities may lead to legal uncertainties which might prevent organisations and individuals from using the licences in the first place. For this and other reasons, the international CC project established a network of affiliate organisations to port the licences to their respective jurisdictions. CCPL3 was ported into more than 60 jurisdictions. It may be doubted that any licence can be valid to the full extent in all jurisdictions worldwide. However, for the time being it seems unlikely that the licence-porting project will continue, even though many right holders would probably prefer to use a licence which is not only translated into their mother tongue but also adapted to their jurisdiction. It is thus predictable that the CCPL3 licences will still be used to a significant extent, at least for some time. Especially for larger projects with many authors and a decentralised licence scheme, this is to be expected. If the licence for numerous works and contributions is supposed to be changed, e.g. to a newer version or another licence type, all rights owners have to agree. This could prove considerably difficult as, unlike some FOSS licences, CC licences do not contain an “any later version” clause. While it is understandable that licensers might prefer a licence that is adapted to their language and jurisdiction, the question of whether ported versions are advantageous depends on a number of complex considerations. In the end, the answer depends on the particular case. Here, it is only possible to give some brief remarks on aspects which should generally be considered. At first glance, it might seem beneficial for an, for instance, French right holder to use the French ported CC licence for their works. To begin with, a licence in one’s mother tongue is linguistically easier to understand. Also, it is easier to estimate the legal implications when the licence is based on one’s national law. Furthermore, the French licence will contain a choice of law clause according to which the licence contract and all other potential issues are governed by French law. This rule simplifies the legal relationships between multi-national licensees and the licenser because it designates one definite jurisdiction as the applicable law. Without a choice of law clause, the identification of the applicable law could be very complex, since it may vary depending on the nationality of the particular licensee or their place of residence. However, it needs to be kept in mind that the legal certainty for the licenser might result in linguistic and legal uncertainties for most of the potential users as far as they live in different countries. Legal uncertainties, in turn, can constrain the use of the work, which the licenser actually wanted to encourage. Therefore, the international/unported CC licences with their “multi-jurisdictional approach” may be regarded as beneficial, especially for online content. The same is true for licences used for multi-national, multi-author collaboration projects. It would make no sense to use a national licence, e.g. for Wikipedia. The result could, and would, in many cases be that the designated jurisdiction was alien to both, the licenser and the licensee. In such projects the private international law solution is more suitable, despite its potential complexity, as it would most likely result in the applicability of either the licenser’s or the licensee’s national law. The international/unported licences have been translated into many different lang-uages. This is true in particular for CCPL3. Official translations for CCPL4 have already been announced and can be expected to be published by the end of 2014. A work which has been modified several times could, in a later version, be subject to a number of different licence versions, even though it has initially been published under a ShareAlike licence. The ShareAlike clause permits the contributor (adaptor) to use not only the original but also a compatible licence for their version. Compatible licences are, e.g. ported versions of the same licence. In addition, the contributor could choose to publish a modified version under a later version of the same licence. For instance, the adapter of a work which has initially been published under a CC BY-SA 3.0 could publish their newer version of the work under CC BY-SA 4.0. Alternatively, if the initial licence was CC BY-SA 3.0 Unported, they could choose a CC BY-SA 3.0 France licence for the adaptation. Importantly, any adaptation of a work still contains the original work. From a legal perspective, the adapter can only licence their modifications; unmodified parts of the work remain under the initial licence. Without a legal solution offered by the licence, the adapter cannot really “re-licence” the work as a whole. This might lead to the confusing situation in which the user of a repeatedly modified work has to obey multiple licences at the same time. The CCPL4 contains a new rule, which offers a simple solution for this problem: The user of the modified version is only bound to the (last) “adapter’s licence” which was attached to the particular version of the work. Former licences which were applicable to earlier versions of the work become irrelevant. All CC licences share a standard set of almost identical general rules. These “general licence features”, which apply to all licence types, will be discussed here. The distinctive licence features “NonCommercial”, “NoDerivatives” and “ShareAlike”, which only apply to some of the licence types, will be elaborated in detail in section 3.5. The licence grant clause in section 2a of the legal code differs slightly across the different licence versions. Common ground is that a non-exclusive, irrevocable, royalty-free and worldwide licence is granted to share and copy the material, irrespective of the type of use. In other words, the work can be reproduced in any form (digital or non-digital) and on any media (e.g. hard disks, paper, servers, etc.). It can also be conveyed by any possible means, e.g. over the Internet, as hard copies (CD, paper among others) or via email. Obviously, the licence grant differs from licence to licence regarding commercial and non-commercial uses – the NC licence being the only one which allows the reservation of commercial usage rights. Also, the right to share modified/adapted versions of the work varies between the ND versions and the other licences. Even though the ND licences permit the creation of modifications, the “adapted material” cannot be distributed without further permission of the licenser, however. According to section 2.a.1 of the legal code, all CC licences are “non-sublicensable.” This wording represents an important basic principle of public licencing: Rights to use the material are granted by the right owner to the user. Users cannot grant rights in the material to other users, i.e. they cannot grant sub-licences. This construction prevents complex licence chains, which would otherwise occur, if the works could be re-distributed by a number of users. The licence terms only come into effect when a use falls within the scope of copyright's exclusive rights. When using a work in a way which is outside the scope of copyright the user does not have to abide by the licence obligations. Below, some examples are discussed when this might be the case. In other words, uses which do not require a licence do not trigger the licence obligations. Statutory freedoms of use (e.g. copyright exceptions), such as the quotation right, are not restricted by the licence, which means that within their scope, the licence obligations are not effective. For example, private copying is often – though not always – permitted by national law. Hence, no licence is required for private copying and, accordingly, the CC licence does not apply to such use. The effect is that the user does not have to meet the licence obligations. For example, the user would not have to credit the author when making a private copy. Should they, however, decide to upload their private copy to a website, the licence comes into effect and the licence obligations become binding. Copyright is limited in many other ways – not only concerning uses in the private sphere. Any use which falls outside of the scope of copyright protection can be conducted without obeying the CC licences. To put it simply, the CC licence obligations, and the respective grant of rights, only become relevant in the context of publication and distribution. Especially in the private sphere, CC material can be used almost without any obligations. Read together the two clauses mean: If the material is not conveyed to members of the public, the user is not asked to comply with the attribution obligation. Simply put, “sharing” means conveying the material to members of the public. But what does public mean in this context? The question is of enormous practical relevance, especially for corporate users and public authorities, but also for private users, since uses in the public sphere are subject to licence obligations and restrictions; uses in the non-public (e.g. private) sphere are not. The importance of the differentiation shall be emphasised by two examples: Imagine a Facebook user posted someone else’s ND-photo on her wall. Before posting it, she has adapted the photo optically and technically. Her Facebook posts are only available to her direct contacts. If this use was considered to be public (because her contacts would be considered as members of the public), the user would violate the licence terms which demand that altered material must not be made available to the public. If the group of her contacts was, however, not considered as a public group, she would act in a perfectly compliant way. Another example may be a company which produces a brochure which includes some modified ND photos. The brochure will only be distributed within the company group but not to third parties. Is the deployment within the group an internal use or a public distribution? If the latter was true, the use would violate the licence terms. The question is even more relevant when it comes to SA licences. As already mentioned, the SA feature obliges adapters to licence their modified version of the material under the same licence. This requirement is often confused with an “obligation to publish.” In fact, the SA provision does not oblige the adapter to publish their modified version. They can keep it for themselves as long as they want. They could also share it with a limited amount of user groups without infringing the SA rule. Hence, SA is not an obligation to share. It is merely a rule on “how to share.” If the adapter’s version is shared publicly, however, it must be licenced under the same or under a compatible licence. Whether it is shared at all, or with whom, is the free decision of the adapter. Hence, the meaning of public or more precisely “providing material to the public,” as the CC licences put it, is essential for the SA clause and crucial in practice. One last example regarding this specific case: Take the above-mentioned situation where the company wanted to share the brochure within the company group. Imagine the brochure was a modified version of another brochure which was initially published under a CC BY-SA licence. The company now adds information containing business secrets, which is why the company would like to keep the second version to itself. If transferring the brochure from one company to another within the group was regarded as “providing material to the public,” the “secret version” would have to be licenced under a CC BY-SA licence. In that case, anybody (e.g. employees or any other third party) could share and republish it. If the use was considered non-public, however, the SA obligation would not be triggered and the company could prevent anybody from sharing it. So, what is the exact meaning of public? Unlike the CCPL3, the CCPL4 licences do not contain an explanation of the term. They only define the term sharing, which on the other hand implies a use within the public sphere. This leaves us having to interpret the central term public on the basis of the applicable copyright law. However, different jurisdictions have different interpretations of this and other terms, which makes it impossible to give a universally valid answer. It is relevant whether the user profits in monetary terms from the use. It is essential whether the communication or making available was deliberately addressed to a public group. Regarding works which are available online, a “making available to the public” requires the targeting of a “new public,” i.e. an audience “that was not taken into account by the copyright holders when they authorised the initial communication to the public.” This means, for example, that hyperlinks to works which are already made available online to the general public (i.e. without technical restriction) cannot be considered as a communication or “making available” to the public. Although these general rules answer a great variety of particular questions concerning the term public in copyright law, they do not allow precise answers for situations which have not already been decided by the ECJ. In other words, the EU copyright acquis lacks a unitary concept of communicating or making available of a work to the public. It is, for instance, hard to determine whether the upload of protected material to a company’s intranet for the access of all employees is a communication to the public, or in the terms of CCPL4, an act of sharing. It is further unclear whether the transfer of copies from one affiliate company to another or from one public authority to another branch of that authority, constitute a communication to the public. In the end, these questions need to be decided on a case by case basis. This is especially true for the interpretation of sharing in the CCPL4 licences, because this term comprises a number of uses which are treated differently under copyright law including, e.g. public display, public performance, distribution, dissemination, communication, or importation, and making material available to the public. Under European copyright law, “distribution” (to the public) means the dissemination of physical copies (e.g. CDs or books). “Making publicly available,” in turn, refers to online uses. Most likely, the notion of public under European copyright law would vary depending on the different use cases. It is safe to stipulate, however, that uses within the private sphere, i.e. within groups having mutual personal relationships, are always non-public. To watch a movie with friends, to send a copy of a text via email to close colleagues or to share photos by making a Dropbox folder available to a small group of selected people, will not be considered as public sharing. On the other hand, any online use which targets a general public qualifies as sharing under the CC licences, as the potential audience is not restricted by technical measures. This applies irrespective of whether the user pursues a commercial or non-commercial purpose. Obviously, there are countless situations which still may be considered either non-public or public. Sharing between separate and independent legal persons, i.e. two individual companies will usually qualify as a (public) distribution; whereas the distribution of material in-house, within one company, will probably not be considered as sharing. Nonetheless, it is still disputed whether the notion of public should be considered differently in the case of distribution (i.e. the conveying of physical copies) and the making available of non-physical copies (via a network or email), as it has not yet been clarified by the European courts under which circumstances the sharing of intangible copies of protected works, e.g. in a corporate or professional environment, can be considered public or non-public. It must therefore be assessed on a case by case basis whether the licence obligations of the CC licences are triggered in the particular scenario. The obligation to name the author and/or other parties designated to receive attribution is essential for most licensers. It ensures that the right holders are credited for their work, which is crucial to gain recognition and/or publicity. Crediting is thus the main reward for the Open Content publisher whether it is the author, company or public institution. The great importance of attribution is highlighted by the fact that all CC licences contain the BY feature. The respective obligation can be found in section 3a of the legal code. First and foremost, it is important to understand that crediting is only effective when the user can relate the credit to a particular work. For instance, if a website provider decided to centralise all crediting information for all implemented images on one central page, they would have to make sure that each credit could be allocated to the correct picture (e.g. by hyperlinking the information to the particular image file). The closer the credit is attached to the work, the more likely the attribution requirement will be complied with and the intent and purpose of crediting retained. The obligation to name the author and the copyright owner is a common rule under copyright law that shall ensure, as mentioned above, that the author gains publicity and possibly monetary rewards. It is also necessary to prevent plagiarism, i.e. to ensure that the original author is acknowledged as the author, and not the user. If the licenser provides a copyright notice, it must be retained. The obligation to supply a copy of or a link to the licence is necessary to ensure that all users can benefit from the licence in the first place. A user cannot observe a licence they are not aware of. Thus, if the licence information is not attached to the particular copy the user has accessed, they will not be properly entitled. The obligation to link to the disclaimer of warranties is based on the same idea. A contractually determined limitation of liability can only be legally valid if it is brought to the licensee’s attention. Since the warranty and liability disclaimer form part of the licence (section 5 of the legal code), this obligation can only be complied with by providing the licence text. To a reasonable extent, the licensee is also obliged to retain Uniform Resource Identifiers (URI) or hyperlinks to the licenced material. This also applies (like all other attribution obligations) to the use in offline publications. Imagine someone used a photo from Flickr in a print magazine: The obligation to link to the source would be complied with by printing the full Flickr URI, thus allowing the reader to find the source. The obligation to indicate modifications has several reasons. First and foremost, it aims to protect the original author’s reputation. If everybody was allowed to modify a work in any way, this could result in modified versions which the original author might not want to be associated with, e.g. because they dislike the style or the quality. The documentation obligation ensures that modifications by third parties are clearly attributed to them and not to the original author. Moreover, this rule ensures that the evolutionary history of the work can be retraced at all times. This is particularly important for massive multi-author collaboration projects such as Wikipedia which rely to a considerable extent on version histories to make the origination process of the articles transparent. One change in CCPL4 compared to former versions is that the attribution requirement does no longer request the licensee to name the work’s title. According to the FAQ under CCPL4 it is still recommended to name the title (if the licenser supplied one), but it is no longer mandatory. Section 4 of the licences’ legal code explicitly addresses database rights. The sui generis right on databases is a European peculiarity which does not exist in many other parts of the world (e.g. the US). It was introduced on EU level in 1996 by means of the Database Directive which is mandatory for all member states. Section 4 of the legal code clarifies that the general licence grant in section 2.a also covers these specific database rights. If the licenced material includes a protected database, it is permitted to extract, copy, reuse and share it in whole or in part. Unlike some ported versions of CCPL3, the CCPL4 licence requires the user to comply with the licence obligations when they use a protected database. Whether these rights are granted depends on the decision of the licenser. It would, for instance, be possible to licence elements of the database but not the database itself. The database and its contents are separate subjects of protection; hence, they can be licenced (or not licenced) independently. If the licenser wanted to restrict the licence to one of these two elements (the content of the database or the database itself) they would have to clearly identify which elements are covered by the licence and which are excluded. Since the grant of database rights is closely connected to the copyright grant, the licence obligations and restrictions are equally applicable to the database rights. If, for example, a database was licenced under a NC licence, the reuse, sharing, copying, etc., would only be permitted for non-commercial purposes. If it was licenced under an ND licence, it would not be possible to take substantial portions of the database and incorporate them into another database. Again, if the database was licenced under an SA licence, any own database which included a substantial part of the original database would have to be licenced under the same or a compatible licence. According to section 2.b.2 of the legal code patents and trademark rights cannot be licenced under the CC licences. This is especially important for corporate and institutional licensers who own trademark rights in their company name, logo, etc. The exclusion of trademark licences means that a trademark associated with the work can only be used to share said work in terms of the CC (copyright-) licence grant. For instance, a CC-licenced book which was published under a registered trademark of the publisher could be copied and shared with the general public. However, no licencee would be allowed to use the trademark in any other way but for sharing this book. They could neither promote their own works under that trademark nor could they allege that the trademark owner endorsed the publication of their own modified versions. This is further ensured by the obligation to mark modifications. One of the main reasons for the nationalised CC licence ports was the different concept of moral rights in different jurisdictions. Moral rights are supposed to protect the personal relationship between an author and their work. Among others, moral rights include the right to first publication, the attribution right and a protection right against distortions of the work (“right of integrity”). Especially the authors’ rights regimes in continental Europe have very strong moral rights which are only negotiable to a certain extent. Nations which pursue a “copyright approach” such as the UK or the US, do not grant such “sacrosanct” moral rights. In these states, moral rights are subject to the freedom of contract, i.e. they can easily be contracted-out, limited or waived. The different approach between the above-mentioned jurisdictions challenges the concept of unitary public copyright licences which are supposed to be valid and enforceable all over the world. Hence, moral rights used to be a major aspect in the porting of the CC licences to other jurisdictions. Licence ports from countries with a strong protection of moral rights, e.g. the German CCPL3, contain special clauses which stipulated that moral rights remained unaffected by the licence grant. The CCPL3 unported version did not address the aspect in any way. This lack of regulation raised doubts on whether the licence grant could be regarded as fully valid under authors’ rights regimes. The intended effect is that moral, personal and other rights which might be affected by the licence, but are outside the scope of copyright, are waived to the maximum extent possible under the applicable copyright law. However, the waiver’s scope is limited, covering only what is necessary to be able to use the licenced work. This approach leaves the decision, how far personal and moral rights can be waived and to what extent they remain in force, to the applicable law. Whether it is legitimate, for example, to use a CC licenced song in a pornographic movie or CC licenced photos in a political campaign will differ from jurisdiction to jurisdiction. However, the resulting legal uncertainty should not be overestimated. Despite their theoretical importance within the authors’ rights regimes, moral rights are de facto much less disputed than commercial rights of use and are very rarely the subject of lawsuits. The moral, personal and data protection rights waiver, or as the case may be, the non-assertion pledge, shall only ensure the usability of the work. If someone made selfies available online and licenced them under a permissive, modifications-allowing CC licence, they should be aware that people might use them in a way that they would not appreciate. Moral and other personal rights, such as the right of integrity, should, however, only be regarded as a last resort to oppose uses in extreme, and therefore rare, cases. A more significant issue which is not – and cannot be – solved by the licences alone is personal rights. Especially photos, videos and articles are often published under a public licence in violation of third parties’ personal rights. For instance, photos or videos showing individuals are published online without their permission. Articles including personal data that should not be conveyed without consent are posted in blogs or on websites. Redistributors of such infringing material can become subject to legal action, irrespective of the public licence. As a matter of fact, the licenser may only decide about rights affecting themselves. If other people’s rights are affected by a publication the licenser has to ensure that all necessary permissions are obtained. If they fail to do so, the infringed person can hold both, the licenser and the licencee, liable. This means, if, for example, a person uses a CC-licenced picture which violates personal rights, they can also be held liable. Whether the user knew or could have known about the infringement of personal rights is irrelevant. All CCPL4 licences contain a comprehensive disclaimer of warranties and liability. This means that the work is shared “as-is” and that the licenser is not liable for any damages, losses or for whatever other harmful event could result from the use of the work. Under European tort law and other regulations, it is not possible to fully exclude all liability for damages and negligence. Section 4.c of the legal code is thus intended to ensure that in the case of mandatory statutory law imposing minimum liability standards, the liability is reduced to the lowest possible level under the applicable law. Whether such a severability (or: salvatory) clause can sustain an (most probably) ineffective liability clause, might be arguable. However, even if the liability rules in CCPL4 were invalid, the liability for damages arising from the provision of CC material (and Open Content in general) would most likely be minimal. Although the actual standard of liability will vary from jurisdiction to jurisdiction, all liability regimes will consider the fact that Open Content is shared without compensation. The contractual liability for contracts without consideration is generally very limited. Under German law, e.g. the prevailing opinion among legal experts is that the statutory liability for public licencing is equivalent to the liability for gifts. Hence, the level of liability is the lowest possible under German contract law. Due to a mandatory provision in the European Copyright Directive, the circumvention of effective TPMs is prohibited in all EU member states and under any circumstances. This means, e.g. that nobody is allowed to reproduce a copy-protected work by circumventing the TPM, not even for private copying or quoting. Section 2.a.4 of the legal code clearly states that TPM protection shall not be effective for CC-licenced works. The effect is that any licencee is allowed to conduct whatever technical modification of the copy of the work is needed to be able to use it according to the licence terms, even if it required the circumvention of an effective TPM. CC licences are concluded perpetually (section 6.a of the legal code), i.e. they apply until the copyright, or any other related rights in relation to the material, expire. After all rights expired, the material becomes part of the public domain and there is no longer a need for a licence. Furthermore, the licence grant is irrevocable (section 2.a.1 of the legal code). Hence, the licenser cannot actively terminate the licence contract. However, the licence terminates automatically upon any breach of the licence conditions (section 6.a of the legal code). Uses which are conducted after the violation has occurred are copyright infringements for which the user can be held liable. For example, if a user failed to attribute the author or did not provide a notice referring to the licence text, they would forfeit their right to use the material. As previously explained, without a licence they would be liable for copyright infringement, just as any other person who uses a protected work without permission. Licences of third parties, however, are not affected by the termination. If the licence is terminated, CCPL4 offers two possible routes to reinstate it. According to section 6.b.1 of the legal code, the licence is reinstated automatically if the infringing licensee remedies the violation within 30 days after they discovered it or after they were informed about it by the licenser or otherwise. Alternatively, the licenser can reinstate the licence expressly (section 6.1.b of the legal code). However, according to the CCPL4 FAQ, the user is liable for any non-compliant uses which were conducted before the licence was reinstated. Besides the abovementioned obligations and restrictions which are valid for all six types of CC licences, the NC, ND and SA licence elements – which are part of only some of the CC licences – are also subject to some specific requirements which a licensee should be aware of. Three of the six CC licences contain the NC element. NC means that the licenser reserves the right to exploit the material commercially. Any user who wishes to use the work for commercial purposes needs additional consent (i.e. an additional licence) from the right holder. NC licences are widespread and very popular among the CC licence suite, at least in some areas. The reasons for this popularity are manifold. Indeed, there can be good reasons to choose an NC licence in particular cases. However, in most situations, the NC versions lead to significant and often unintended drawbacks. As the NC restriction affects free distribution and inhibits many uses (often unintentionally), they are generally not considered as “open/free culture” licences. Even in the context of education and research, the use of NC-content is characterised by legal uncertainty. For example, NC content cannot be integrated into Wikipedia, as Wikipedia uses a CC BY-SA licence. For these and other reasons, NC licences are highly disputed in the Open Content community. It is not the task of this guide to resume or comment on these discussions and its various arguments. Instead, it is the aim of this guide to explain the NC restriction and to hopefully clarify some misunderstandings about it. Below, however, some of the arguments are taken up to explain strategic aspects regarding the selection of the appropriate licence for different cases. What is the meaning of NonCommercial? The clause only mentions one specific use: Peer-to-peer file-sharing is deemed non-commercial. In other contexts, uses must be individually examined whether they are “(not) primarily intended for or directed towards commercial advantage or monetary compensation.” This leaves a wide margin for interpretation. Thus, it is impossible to give an objective and general answer to the question of when a use is commercial or non-commercial. Being a contract, the licence has to be interpreted from an objective point of view considering the views of both, licenser and licensee. Moreover, due regard must be paid to the applicable law in the particular case. In 2008, CC conducted a survey investigating the perception of creators and users regarding the commercial/non-commercial dichotomy. The findings revealed that creators and users have by and large a common understanding of the general meaning of the terms commercial and non-commercial. Concerning borderline cases and specific questions, however, the results of the study were not very conclusive. Altogether, the survey can serve as an interesting pool of information, as it reflects similarities and differences in the views of different stakeholders. One interesting overall result was, for example, that users tend to interpret the NC clause more restrictively than the right holders themselves. However, due to its limited scope and non-representative character, the study cannot be used as a reliable source for legal interpretation. On the whole, there is no unitary interpretation of the terms commercial and non-commercial, and with regard to the different jurisdictions, cannot be expected to exist. Nonetheless, an attempt will be made below to give some concrete answers for certain typical use-cases, although these must be understood as the author’s personal opinion only. The distinction given here between commercial and non-commercial is based on two general factors: user-related aspects and use-related aspects. Each category comprises a number of more detailed factors which indicate commercial or non-commercial uses respectively. In addition, the two general factors, combined with further indicators, should give a good overview about a number of typical use-cases. The general attitude of a user towards for-profit or not-for-profit activities is not the only determining factor, but a strong indicator whether their uses should be classified as commercial or non-commercial. The term commercial has to be understood in a broad sense. If the use serves even a remote financial interest of the user, it must be deemed commercial. It may be assumed that activities of profit-oriented users (especially companies) generally serve a business interest, at least remotely. Uses that generate direct profits should always be considered commercial. Whether the particular use (also) serves the public interest or only the self-interest of the user has some relevance for its classification as commercial or non-commercial. Among the uses of individuals, there is a difference between job-related and private uses. If the use is job-related, the classification depends on whether the intention of the employer/client is “primarily directed towards commercial advantage.” In other words, a use could be commercial even if the user did not follow their own commercial interests but supported those of a third party. If the use only serves a private purpose and only takes place in the private sphere, it is always non-commercial. Apart from these differences, it is irrelevant who the user is. Individuals can follow commercial interests much the same as legal entities or institutions. Uses that are covered by copyright limitations and exceptions do not fall into the scope of the licence. If such regulations permitted certain commercial uses, the NC restriction would not be effective. A freelancer is an individual who runs a business and uses the material for their business interests. The term freelancer shall be understood in a broad sense. It shall include inter alia artists who make a living from their creative work. A private person is an individual who uses the material for private purposes only. Uses of individuals which are conducted to fulfil their job-related duties are deemed to be uses of their employers. In case a private person acts commercially on their own account, e.g. by selling hardcopies of CC licenced-material, they are considered a freelancer. The following assessment has to be understood as a reflection of the author’s personal opinion only. Some projects which use NC licences offer explanations of their own, which might not fully match the author’s assumptions. In these cases, it is recommended to follow the guidelines of the respective project. As mentioned before, NC licences have several drawbacks. As such, the decision to take such a restrictive licence should be carefully thought through. The author’s impression is that most creators who decide to use an NC licence do so because they do not wish other people and organisations to make money with their creative work without an obligation to share potential profits. This motivation might be understandable from a psychological point of view. However, in many cases it leads (without any good reason) to a lose-lose situation. The licenser loses many potential users and uses that would in actual fact serve their interest – broad distribution and widespread attention to the work. Many users cannot, or at least dare not (because of legal uncertainty) make use of the work not even for purposes the licenser would not object to. The NC element might also affect uses for educational and academic purposes, as the question whether NC content can be used in tuition-based courses (see the chart) is highly disputed. The same is true for scientific uses within public-private-partnerships or even publicly funded research. Even the use on entirely “private” websites where publishers try to recover some of their hosting costs through advertising, is arguable. Would a right holder actually like to prevent these uses? Is it likely that such users would seek individual permission when their use might not be permitted by the licence? Would they conduct an in-depth legal examination to ascertain whether their use is legitimate or not? An objective evaluation of the advantages and disadvantages of NC licences leads to the conclusion that their disadvantages outweigh the benefits for both creators and users in the great majority of cases. From an objective standpoint, the selection of an NC licence is only appropriate if there are realistic prospects that commercial users will pay to use the material. In many cases this is (above all in relation to online content) highly unlikely, especially without an elaborate marketing strategy. Moreover, if the licenser is not willing or not able to enforce potential violations of the NC restriction by taking legal action, it hardly makes sense to impose it in the first place. When choosing a licence, it is of utmost importance to be aware of the reasons why a particular Open Content licence is chosen. In the majority of cases, careful consideration will reveal that non-pecuniary motives prevail. There are altruistic reasons, such as the wish to contribute to a cultural commons or to inform people about important subjects. However, the majority of considerations will be of a rather egoistic kind. Widespread distribution draws attention to the author’s work. Attention can result in engagements, popularity or even fame. If, for example, the creator is not able or willing to establish and maintain a professional commercial distribution strategy themselves, why not enable others to develop a channel and reach out for an audience which they could not reach themselves? For corporate licensers and creators who are already well known and successful, NC licences can be a good choice, provided they are employed as a tool to support an elaborate marketing strategy. Musicians, for example, can use NC licences to draw attention to their work by publishing some of their works on websites or platforms. Should they be able to attract significant commercial interest, no publisher could exploit their work without negotiating individual terms. However, it is very likely that publishers would contact creators and musicians before investing into the distribution and marketing of their works anyway, i.e. irrespective of whether their material was published under a NC licence or not. Akin to the publishing business (especially fiction publication), a successful music distribution requires a close liaison between creators and commercial exploiters. If the music distributor wanted to establish a successful band, they would have to arrange concerts, interviews, media coverage, merchandising and so on. Without cooperation between artists and publisher, this would be impossible. In other words, the possibility of using the music without individual consent will in most cases not prevent a commercial exploiter from having to negotiate individual terms. That said, NC licences are generally only advantageous for professional publishers who can afford to create and deploy complex marketing strategies and who are willing and able to pursue licence violators. NC licences enable price differentiation and so-called dual licencing business models. Similar to the shareware and freeware concepts in the software world, there are possibilities to freely share (under CC NC) abridged versions of books, movies or to convey other “light versions” for free in order to draw attention to the work. The “full versions” can then still be marketed commercially. Whether such strategies are feasible should be evaluated thoroughly weighing up the pros and cons. On the whole, the number of situations where the use of NC licences is the best choice is very limited. There might, however, be a better option which could also serve the intended effect (prevent commercial users to use the work without individual negotiation), while avoiding many of the negative side effects of the NC licences: Some commentators argue that CC SA is “the better NC”. In short: The SA licence grant is not restricted to non-commercial uses and does therefore not impede the free (commercial) use. However, commercial users such as publishers or music companies would be reluctant to use SA content without additional permission because they could only do so under the same licence (CC BY-SA). To arrange a commercial (i.e. traditional) distribution they would need additional rights or exceptions, i.e. the need to negotiate with the creators would arise nonetheless. Furthermore, if a commercial distributor included SA material in their own works, e.g. by sampling or synching CC music with a film, the SA obligation would also apply to their own material. In other words, the film would have to be distributed under the CC licence due to the copyleft-effect, sometimes also referred to as the “viral effect.” This makes it all the more unlikely that CC SA material would be integrated into commercial productions without further consultation of the licenser. Two CC licences contain the restriction NoDerivatives: CC BY-ND and CC BY-NC-ND. As any licence restriction, the ND element does not mean that the material cannot be adapted or modified at all. It rather means that the right to modify the work is reserved, i.e. anyone who would like to publish an adapted version of the material must obtain an additional licence. Intent and purpose of the restriction is to protect the integrity of the work. Section 2.a.1.B of the ND licences’ legal code points out that adapted material can be produced but not shared. Hence, the ND restriction only applies when the adapted material is shared; its production and private use is still allowed. The clauses in CCPL4 are the same as the respective rules in CCPL3. As such, there is no difference between the licence versions. There are some examples in the legal code of uses, which are to be considered adaptations and uses, which are explicitly excluded from this definition. According to section 1a of the legal code, an adaptation takes place when the material is “translated, altered, arranged, transformed, or otherwise modified in a manner requiring permission under the Copyright and Similar Rights.” According to section 2.a.4 of the legal code, mere technical modifications are, however, not deemed adaptations. The latter means that format shifting is not considered an adaptation nor is the digitisation of a non-digital work. In these cases, the work itself remains unchanged. The digitisation of a printed novel, for instance, does not change the novel (the work), but only the media in which it is embodied. Therefore, it is not considered an adaptation or modification under copyright law but simply a reproduction of the work. To determine which uses are adaptations is much more difficult. The licence gives examples of some acts which are usually considered modifications/adaptations under copyright law: Translations and the transformation of a work into another category of work, e.g. making a film out of a novel, are considered adaptations. Also, the act of synching music with other works, e.g. to use music as a background for a video, is indisputably deemed an adaptation. Apart from these explicitly mentioned acts of modifications, no further explanation is given. The licence directs the user to the applicable law. This makes it impossible to give unitary answers. To which extent licensees can republish adapted material, will vary from jurisdiction to jurisdiction. This is even true for different jurisdiction within the European Union, as the European copyright acquis communautaire has not yet harmonised the modification right, i.e. there is no unitary EU-wide concept of adaptations. Whether users of ND content need an additional licence for certain kinds of use depends on several aspects. The question is: Does the applicable law consider the particular use as a use of an adapted/modified version of the work? Modifications of the work itself, e.g. abridgements, extensions, or re-arrangements of its content are generally considered adaptation under copyright law. This applies irrespective of whether the adaptor owns the copyright in the modified version, because the modification itself is subject to copyright protection. More complex questions arise when verbatim copies of the work are used in a new context. Can, for example, an ND photo be used in a book where it is framed by an article? Can someone publish a collection of 100 photos of different origin, including ND images, on a website? Can someone include an ND text in an anthology combining articles written by a number of authors? Can someone exhibit an ND video in an artistic video collection? Can someone combine several media, including ND sound recordings, in a multimedia installation and sell them? All these questions can only be answered on a case-by-case basis under consideration of the applicable law. The legal situation for Italian users can thus be different from the legal situation for German users. As the legal terms adaptation or modification need to be interpreted, it is very important to know the applicable (national) case law to assess the issue in question. The distinction between collections and combinations of works will most likely be an important factor under every jurisdiction. In a collection, e.g. an anthology or a catalogue, a number of works are simply put together for publishing. The different contents stand alone as separate and distinguishable works, so their identification and the identification of each author are unproblematic. Hence, to include a work into a collection will usually not be considered an adaptation. On the other hand, combining works will in many cases have the effect of “entwining” the individual works causing them to lose their individual expression. Depending on the technique, work combinations tend to display their own aesthetic expression which differs from the individual works which were used. If this is the case, the result will usually have to be considered as “adapted material” and the ND licence will not permit its publication unless allowed under the applicable copyright law. One determining differentiator between collections and combinations is whether the individual works remain separate and distinguishable in the given context. If the work itself was modified, e.g. a text was curtailed or a song remixed, the ND restriction would apply in any case, since mashing up and remixing will usually involve such modifications. If a verbatim copy of the work was, however, simply grouped with others, the result would in many cases be a collection rather than a combination, i.e. there would be no adaptation. If verbatim copies of works were combined to create a new comprehensive work with its own aesthetic expression, the new work would also have to be considered “adapted material.” Here, the combined material would not be “grouped” but rather “merged” resulting in the emergence of a new and larger work which contains both, own and reused material. Examples for this would include the use of a copyright-protected image in a movie, the use of a copyright-protected cartoon character in a video or the above-mentioned use of music tracks in moving images. In light of the above, it would seem appropriate to adopt the following principle as a general rule of thumb: Every time existing material is merged into a larger work which has a character of its own, the works are adapted in the terms of copyright and the CC ND restriction. The more the individual works are used “as-is” and “stand-alone,” i.e. they are only grouped, the less likely their combination/collection will be considered as adapted material. Following this distinction, it is possible to make a relatively clear cut between adaptations which are not permitted under ND, and mere reproductions, which are. Some typical constellations are explained in the chart above. Most relevant for the answer is whether the reused work(s) remain separate and distinguishable in the given context, i.e. whether they were modified or verbatim copies were used. If the reused work itself was modified, e.g. a text was shortened or a song remixed, the ND restriction would apply in any case. Therefore, the answer is “No” (cannot be used under ND). By contrast, in all cases marked “Yes” it is presumed that the reused material itself is used “as-is”. If the reused work was merged with other material into a new and larger work, the answer would be “No.” This is the case when all the material is mashed/mixed as to create a new and larger work with an aesthetic expression which replaces the independent expression of the reused work(s). The creation of adaptations as such is not restricted by the ND clause, if the material is not published. The classifications above only express the author’s personal understanding of the distinction between adaptations and reproductions. Some projects using ND licences might offer their own explanations. If this is the case, it is always recommended to follow the guidelines of each particular project. Whether ND licences are the best licence choice depends very much on the particular situation. Reluctance to allow other people to “tamper” with one’s creation is an understandable but rather subjective reason. Instead, it might be preferable to base decisions on more objective aspects or at least to balance subjective and objective arguments. From an objective viewpoint, one might have to concede that if the licence does not permit modifications, the positive effect for the cultural commons cannot be achieved. In fact, the ND licences share several drawbacks with the NC and other restricted licences. First of all, as already mentioned in the NC section, it is pointless to opt for an ND licence if it is impossible to enforce any potential violations of the restriction. Furthermore, one should consider the detrimental effect of the legal uncertainties which come with licence restrictions. Users who might have wanted to use the content might be discouraged by the vague ND restriction. Finally, many of the generally beneficial effects of Open Content could not be achieved with ND-licenced content, as an individual agreement (a licence deal) would be needed in order to be able to merge the material with other content. Otherwise it could not be improved, updated or translated; music could not be remixed or sampled, video sequences could not be mashed. Whether it is in their interest to prevent creative uses or uses which might improve their work, is for the licenser to decide. For some types of works and some publishing purposes, ND licences are more appropriate than for others; the same applies for different types of publications. Material with an informative purpose, for example, can benefit greatly from the possibility of modification. Modifications can improve or update the information contained therein or even iron-out mistakes. A project such as Wikipedia, for instance, could not function under an ND-licence regime. Educational resources need to be modified and translated in order to make them useful in other parts of the world or for different target groups. Therefore, Open Educational Resources (OER) should not be published under ND licences. These considerations will also apply to many other informative and/or educational works. Works, on the other hand, which serve only an aesthetic purpose (such as music or movies) cannot be “improved” in the proper sense. Whether they are good or not is in the eye of the beholder. However, if someone would like to advocate or contribute to a cultural commons, an ND licence is not an appropriate option. CC itself refuses to grant the ND licences the status “Approved for Free Culture!” ND material can neither be remixed nor mashed nor otherwise changed. Anytime ND-licenced contents are combined with others in whichever way, the use will be characterised by legal uncertainty. In some cases, although much less often than most people would expect, it can be reasonable or even necessary to protect the integrity of the work with an ND licence. This is, for example, true for “certified information” required for regulation which can or should not be modified by anybody other than the certifying institution. This includes, e.g. technical standards and other norms, including legal norms. ND licences can also be used to support certain business models. It might, for example, be possible for somebody to publish a generic version of textual information which needs customising to be useful or applicable in particular cases. By using an ND licence, the publisher reserves some kind of exclusivity on customisation, whereas under a licence automatically permitting the publication of adaptations others could be encouraged (and would be allowed) to spread such customised versions free of charge. These examples show that objective factors suggesting the use of ND licences are rather rare. Of course, anyone is free to decide that their work should not be modified without individual permission. Such a decision should, however, be weighed against the mentioned drawbacks of these licences. Two CC licences contain the ShareAlike element. SA means that adapted material can only be published under the original or under a compatible licence. In CCPL4, the SA clause (section 3b) states: “In addition to the conditions in section 3(a), if You Share Adapted Material You produce, the following conditions also apply. In short, this means that the adaptor (who publishes a modified version of the material) is bound to use the licence conditions chosen by the original licencer. The adaptor is not allowed to further restrict the users’ freedoms, may they result from more restrictive licence conditions, from technical restrictions or anything else. The sense of this “contagious freedom” is easily explained: All manifestations and shapes of a work should share the same freedoms. Within this reasoning, the rule does indeed make sense: Licences without SA enable others to “monopolise” the content. A record company could, e.g. take a music song which was published under CC BY, remix it and market the result “unfree”(i.e. commercially or against royalties). SA clauses prevent such “monopolisations” through their viral effect on modifications. When does the SA condition apply? SA applies to the publication of adapted material. Hence, the rule applies only when a) the material is adapted and b) it is shared. SA does not oblige anybody to share adapted material. On the contrary, adapting the work and keeping it to oneself is perfectly legitimate. What does SA mean? Which licence must I use for the publication of adapted material? The adapted material is shared under the same CC SA licence as the original (e.g. CC BY-SA 4.0 International) or any later version of this licence (e.g. CC BY-SA 5.0 International). The adapted material is licenced under a CC licence with the same elements as the original licence. This applies especially to ported versions. A modified picture which was initially licenced under CC BY-SA 3.0 Unported could thus be shared under CC BY-SA 3.0 Germany. Again, later versions of such ported version could be used as well. Under CCPL4, this second option might, however, become obsolete, as no ported versions of the licences are planned as of today. The adapted material is licenced under a CC BY-SA “compatible licence.” At present, this third option is obsolete. Compatible licences are referred to as licences which have been approved by CC (see section 1c of the legal code and the referring link in the clause). The clause was already contained in the CCPL3 licences. However, as of today not a single licence has been approved. According to section 3.b.3 of the legal code, the adapter may not impose additional rules or further restrictions on downstream users. In other words, if an adaptor used the initial licence (e.g. CC BY-SA 4.0) for their version, but restricted the rights in their general terms and conditions or addenda to the CC licence, they would violate the SA clause. As explained above, SA requires adaptors to re-licence their modified material under the same licence. Let us imagine an adaptor mixes BY-SA, BY-NC and BY-NC-SA video snippets to create a mashup: As the components of the mashup are indistinguishable, the new work has to be licenced under one single licence (e.g. BY-SA). In this case, both the BY-SA licence and the BY-NC-SA licence stipulate: “You can share the mashup (the adaptation) only under my license terms.” Obviously, this is impossible. The adaptor can only licence the mashup under either BY-SA or BY-NC-SA, as both licences contain different and in the end contradicting conditions. The BY-NC-SA licence prohibits commercial uses, whereas the BY-SA licence permits them. Hence, both licences are incompatible. The result is referred to as the “licence incompatibility problem.” A licence incompatibility is a situation where the user can comply with only one of two or more conflicting licence obligations. In other words: The adaptor either violates one licence or the other. Licence incompatibilities are a big problem for free culture. Its central idea is to create a pool of freely reusable content that can be mixed, mashed up and otherwise combined easily. Licence incompatibilities, on the other hand, not only increase the legal uncertainties of remixing, they also prohibit many potential uses. The dimension of the licence compliance problem is illustrated by the fact that most of the CC licences are incompatible with each other; resulting in the undesirable effect that content with differing licences cannot be combined. 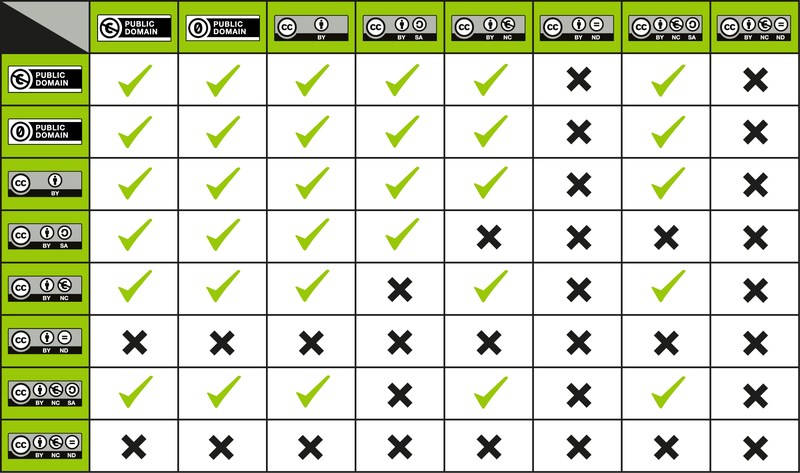 The following chart shows that 32 out of 64 possible ways to combine differently- licenced CC works in a remix, mashup or other larger work are not permitted. The chart illustrates that the more restrictive the licence is, the less likely the content can be mixed with others in a larger work. The explanation is quite simple: NC material can, for instance, not be mixed in a remix that will be published under a licence that allows for commercial use. Doing so would make the NC work commercially usable since it will form part of the remix. SA material, on the other hand, can only be re-licenced under the same licence. SA works can therefore only be combined with other content that is published under a licence which allows for the re-licencing under any other licence. The combination of CC BY-SA and CC BY content could, for instance, be licenced under CC BY-SA because the BY licence allows that. Despite the increasing efforts to solve the compatibility problem one way or another, it is undeniable that little success has been achieved so far. However, solving the compatibility problem may be regarded as a key condition for the success of the whole system. A “creative commons” in the proper meaning can only serve its own purpose when the content contained can be (re-)used creatively. Incompatible licences are an obstacle to this core objective. Moreover, they contradict the wish to make it legally possible to use the outstanding technical possibilities to remix/mash up works. As SA licences (like all restrictive licences) amplify the problem of licence incompatibility, their use should be considered thoroughly. In general, the ShareAlike principle is convincing: Open content should stay open in all its forms and iterations.102 Overly permissive licences enable the appropriation of Open Content by pulling it out of the cultural commons. On the other hand, permissive licences are much easier to handle. It might even be argued that they provide more incentive to use the content. In the end, the licenser has to balance the different motivations: Is it more important to ensure the openness of the material (then CC BY-SA would be the appropriate licence) or to encourage as much interest in the use as possible (then CC BY should be used)? ↑ The CC licencing model is explained here: http://creativecommons.org/licenses/?lang=en. ↑ Unless otherwise stated all references to CC licences refer to Version 4 (CCPL4). Regarding the different licence versions, see: chapter 3.1. ↑ Usually the user will be asked to credit the author’s real name. If the licenced material refers, however, to a pseudonym or was published anonymously the user is requested to credit accordingly. ↑ See as to the details of the SA clause, see chapter 3.5 section c.
↑ The “adapter’s licence” is defined in section 1b of the legal code. The term refers to the licence that a contributor uses to share their adapted version of the work. ↑ For the text, see: http://creativecommons.org/publicdomain/zero/1.0/legalcode. ↑ See for example: Kreutzer. 2011. Validity of the Creative Commons Zero 1.0 Universal Public Domain Dedication and its usability for bibliographic metadata from the perspective of German Copyright Law; http://pro.europeana.eu/c/document_library/get_file?uuid=29552022-0c9f-4b19-b6f3-84aef2c3d1de&groupId=10602. ↑ See CC0 section 3 according to which the “affirmer” (the person who uses CC0 for her work) “grants to each affected person a royalty-free, non- transferable, non- sublicensable, non-exclusive, irrevocable and unconditional license….” In short: The fall back licence permits any use whatsoever without conditions. ↑ Regarding these questions, see: Kreutzer. 2011. Validity of the Creative Commons Zero 1.0 Universal Public Domain Dedication and its usability for bibliographic metadata from the perspective of German Copyright Law. p. 11 et seq. ; pro.europeana.eu/c/document_library/get_file?uuid=29552022-0c9f-4b19-b6f3-84aef2c3d1de&groupId=10602. ↑ For more information on the Europeana Public Domain Calculator, see: http://outofcopyright.eu. ↑ See an overview at: creativecommons.org/version4. A more detailed comparison including references to the different drafts of CCPL4 and the drafting process can be found here: http://wiki.creativecommons.org/4.0. ↑ For more information about the history of this process and the CC International approach, see: Maracke. 2010. Creative Commons International. The International License Project. JIPITEC, vol. 1 , issue 1, p. 4-18; https://www.jipitec.eu/issues/jipitec-1-1-2010/2417. ↑ The unported CC licences are not focused on a particular jurisdiction, neither in linguistic nor in regulative terms, i.e. they should not be confused with the (national) USCC licences. According to section 8f CCPL3, the terminology of the unported licences is based on international copyright treaties, like the Berne Convention for the Protection of Literary and Artistic Works, the Rome Convention or the WIPO Copyright Treaty. See: http://wiki.creativecommons.org/Version_3#Further_Internationalization. ↑ Another problem with the application of US licences in Europe can be caused by moral rights regulations. In some nations, like the US, they can be waived by contractual agreement (e.g. by a licence). In other territories, for instance in some continental European authors’ rights jurisdictions such as France or Germany, they cannot be waived nor assigned to a third party and there are restrictions on licencing. ↑ Even when ported licence versions are used for transnational licencing, a number of problems may arise, especially in the field of private international law which designates the applicable law in such cases. These issues cannot be elaborated upon in this guide. For further information see: Maracke. 2010. Creative Commons International. The International License Project. JIPITEC, vol. 1, issue 1, recitals 33-38; https://www.jipitec.eu/issues/jipitec-1-1-2010/2417 and Jaeger/Metzger. 2011. Open Source Software. 3rd edition. Beck, Munich. Recitals. 381-382 (in German). ↑ See: http://wiki.creativecommons.org/Frequently_Asked_Questions#What_if_CC_licenses_have_not_been_ported_to_my_jurisdiction_.28country.29.3F. However, as it is also stated, official translations of the international version will be provided. ↑ Such a clause has the effect of allowing the licensee to decide whether they want to use the material under the previous or the new licence version - after a new licence version was published. As such, newly introduced licence versions can spread faster. Section 14 of the GNU General Public Licence version 3 is an example for such a clause. ↑ It should also be noted that the international versions are available in many languages. ↑ The international/unported licences do not contain a choice of law rule. The clause that addressed this topic in CCPL3 (section 8f of the legal code) was not included into CCPL4. ↑ The determination of the applicable law depends on the rules of “private international law.“ These rules can vary from country to country. Hence, without a choice of law rule in the licence, it can occur that Canadian law determines a different applicable law than Spanish law for a licence that was concluded between a Canadian rights owner and a Spanish user. The possible result is that the applicable law differs from one licenser-licensee relationship to the other. ↑ Obviously, only users who read French can understand a French licence text. Furthermore, the national licences generally use specific terms of the respective jurisdiction. Their interpretation can be challenging even for foreign lawyers who are native speakers (e.g. Franco-Canadian lawyers who have to apply French law). ↑ E.g. in a case where a Russian user (licensee) uses the article of a Brazilian author in their blog. ↑ The rule is not easy to detect. It can be found in section 2.a.5.B of the legal code, which reads: “Additional offer from the Licensor – Adapted Material. Every recipient of Adapted Material from You automatically receives an offer from the Licensor to exercise the Licensed Rights in the Adapted Material under the conditions of the Adapter’s License You apply.” See: http://creativecommons.org/licenses/by-sa/4.0/legalcode. ↑ This is true at least as long as the adapter complies with the ShareAlike rule and chooses a legitimate adapter’s licence. However if that were not the case, because, e.g. the adapter used a BY-SA-NC for a modification of a work that was initially licenced under BY-SA, they would violate the licence obligations. The effect would be that the licence for their version of the work was null and void because of the automatic termination clause until the infringement was cured. See: chapter 3.4, section i. ↑ Of course, adapters can and have to licence their versions of the work themselves. ↑ However, the NC restriction is also relevant for in-house uses. According to section 2.a.1.A of the CC NC licences’ legal code, “reproduction” is permitted by these licences only for non-commercial uses, i.e. the NC licence feature restricts not only uses that are directed to the public but also internal uses. ↑ E.g. sharing via password-protected servers that are available only to certain users is perfectly compliant with the SA provision. See the FAQ: http://wiki.creativecommons.org/Frequently_Asked_Questions#Can_I_share_CC-licensed_material_on_password-protected_sites.3F. ↑ According to the judgment of the ECJ, the patients of a dentist are not a large group that qualifies for that criterion. See: ECJ Case C-135/10 - Società Consortile Fonografici (SCF) vs. Marco Del Corso, paragraph 84; http://curia.europa.eu/juris/document/document.jsf?text=&docid=120443&pageIndex=0&doclang=EN &mode=lst&dir=&occ=first&part=1&cid=298306. ↑ However, in the dentist’s case the ECJ did not assume that the succession of patients ultimately form a public group. See: http://curia.europa.eu/juris/document/document.jsf?text=&docid=120443&pageIndex=0&doclang=EN &mode=lst&dir=&occ=first&part=1&cid=298306. ↑ In an ECJ case, the court held that a dentist practice would not increase its income by playing radio programs in the office. See: ECJ Case C-135/10 - Società Consortile Fonografici (SCF) vs. Marco Del Corso, paragraph 88; http://curia.europa.eu/juris/document/document.jsf?text=&docid=120443&pageIndex=0&doclang=EN&mode=lst&dir=&occ=first&part=1&cid=298306.In another case it maintained, however, that for a hotel owner the reception of TV programs by guests had an economical impact on the business. See: ECJ case C-306/05, Sociedad General de Autores y Editores de España (SGAE) vs. Rafael Hoteles SA, paragraph 44; http://curia.europa.eu/juris/showPdf.jsf?text=&docid=66355&pageIndex=0&doclang=EN&mode=lst&dir=&occ=first&part=1&cid=300896. ↑ E.g., if somebody listens to a radio sitting in a park, they do not intend to entertain the passers-by – ergo there is no public use. ↑ See: ECJ, Case C-466/12, Nils Svensson et al vs. Retriever Sverige AB, paragraph 24; http://curia.europa.eu/juris/document/document.jsf?docid=147847&doclang=EN. ↑ The ECJ also held in this decision that it was irrelevant if “the work appears in such a way as to give the impression that it is appearing on the site on which that link is found, whereas in fact that work comes from another site.” This could mean that embedding content e.g. in YouTube videos, is not making available under copyright law and requires therefore no authorisation of the rights owner. ↑ The distinction between commercial and non-commercial uses only becomes relevant with regard to CC NC licences, see chapter 3.5 section a. It is a common misunderstanding that copyright distinguishes between commercial and non-commercial uses. The most essential borderline is rather drawn between public and non-public uses. ↑ This is true at least from the copyright perspective. See: Jaeger/Metzger. 2011. Open Source Software. 3rd edition. Beck, Munich. Paragraph 46 (in German); Meeker. 2012. The Gift that Keeps on Giving – Distribution and Copyleft in Open Source Software Licenses. International Free and Open Source Software Law Review Vol. 4, Issue 1, p. 32. ↑ Section 3.a.2 of the legal code states: “You may satisfy the conditions in section 3(a)(1) in any reasonable manner based on the medium, means, and context in which You Share the Licensed Material. For example, it may be reasonable to satisfy the conditions by providing a URI or hyperlink to a resource that includes the required information.” For details see the CC FAQ: https://wiki.creativecommons.org/Frequently_Asked_Questions#Can_I_insist_on_the_exact_placement_of_the_attribution_credit.3F and https://wiki.creativecommons.org/Frequently_Asked_Questions#How_do_I_properly_attribute_material_offered_under_a_Creative_Commons_license.3F. ↑ See: http://wiki.creativecommons.org/Marking/Users. Another informative source is a guide on how to attribute CC licenced material, provided by CC Australia: http://reativecommons.org.au/content/attributingccmaterials.pdf. ↑ According to the German CCPL3 licences the licenser waives all database rights (see section 3 of the legal code, last sentence). The effect of such a waiver is that the licenser gives up the ownership in the database. Thus, all involved database rights cease to exist and no licence can be granted anymore (no rights, no licencing). ↑ In the CC wiki, one can find further information about marking works with CC licences in different use- cases. See for details: http://wiki.creativecommons.org/Marking_your_work_with_a_CC_license. ↑ That means, on the other hand, if somebody used a CC licenced database in a jurisdiction where the applicable law did not provide for database rights, the user would not be bound by the licence obligations since CC does not create rights that are not granted by the applicable law. If no IPRs were granted, the CC licence would not be applicable. See: section 2.a.2 of the legal code. ↑ Further details are explained at: https://wiki.creativecommons.org/Frequently_Asked_Questions#If_my_use_of_a_database_is_restricted_by_sui_generis_database_rights.2C_how_do_I_comply_with_the_license.3F. ↑ See section 4d CCPL3 Germany: https://creativecommons.org/licenses/by/3.0/de/legalcode. ↑ This rule, however, does not apply to trademark or patent rights. They are addressed in a different clause, which was explained in chapter 3.4 section e.
↑ For regimes that do not allow waivers of moral rights the clause provides a fallback option in the form of a non-assertion pledge, i.e. the licenser does not waive the rights but agrees not to assert them. ↑ Such questions are especially relevant for content published under licences that allow modifications. However, they can also be fundamental for uses of verbatim copies. The integrity right not only protects against modifications that distort the work, it can also (depending on the applicable law) prohibit uses of the original version in contexts that could harm the author’s reputation, including political campaigns. ↑ See “Deliberately giving up control” in chapter 2.3, section c.
↑ To what extent the user is liable and what claims they might face depends on the applicable law. ↑ For that reason, many CCPL3 ports for EU Member States contained adapted liability disclaimers to conform to the national regulation. ↑ See: Directive 2001/29/EC, Art. 6. ↑ The respective clause in CCPL3 that contained this provision was deleted in CCPL4. Section 7.a CCPL3 states: “Individuals or entities who have received Adaptations or Collections from You under this License, however, will not have their licenses terminated provided such individuals or entities remain in full compliance with those licenses.” From a legal perspective this is self-evident, so the deletion of this clause should make no difference from a legal perspective. See: http://creativecommons.org/licenses/by/3.0/legalcode. ↑ See the explanation in the FAQ: https://wiki.creativecommons.org/Frequently_Asked_Questions#How_can_I_lose_my_rights_under_a_Creative_Commons_license.3F_If_that_happens.2C_how_do_I_get_them_back.3F. ↑ For reference, see footnote 62. ↑ A recent study about the dissemination of different CC licences in certain contexts showed e.g. that nearly 70% of all images published under a public licence on Flickr were published under an NC licence (see: http://cc.d-64.org/wp-content/uploads/2014/03/CC_in_zahlen_infografik2.pdf). An analysis of the Directory of Open Access Journals (also contained in this study) revealed that 45% of the articles were licenced as non-commercial, although 52,5 % were licenced under CC BY. as well as the ND variants, do not exhibit the “Approved for Free Culture Works” logo on their licence deeds. ↑ See “Advantages and Disadvantages of NC licences” in chapter 3.5, section a. ↑ For advantages, and especially disadvantages of NC licences see: Klimpel. 2013. Free knowledge thanks to Creative Commons Licenses – Why a non-commercial clause often won’t serve your needs, https://www.wikimedia.de/w/images.homepage/1/15/CC-NC_Leitfaden_2013_engl.pdf. ↑ See: http://de.creativecommons.org/2013/11/25/version-4-0-ist-da/ (in German). ↑ See section 1.d. of the legal code: https://creativecommons.org/licenses/by-nc-nd/4.0/legalcode. ↑ Obviously, it makes a huge difference if any use that is “directed towards commercial advantage” is considered commercial or only those, which are “primarily directed towards…” If the former were true, even very remote commercial advantages would suffice to suggest a commercial use. In the latter case, however, the commercial purpose had to be a main objective. ↑ See the blogpost on the CC website (including links to all material): http://wiki.creativecommons.org/Defining_Noncommercial. ↑ From a legal perspective, the findings of the study can be, very cautiously, used for a basic risk assessment. If it turned out in a broad survey that many creators did not consider a certain use commercial, there is some probability that other licensers will share that opinion. Obviously there is no guarantee that this applies to the particular case or that the argument stands up in court. ↑ The survey reflects only the perception of certain groups of licensers and licensees. Only US creators and users were interviewed. In addition, the questions related solely to online content. Unfortunately it does not consider the applicable law either. Hence, the findings might reveal interesting facts. However, for the legal interpretation of the dichotomy between commercial and non-commercial, their significance is very limited. in chapter 3.4, section i). ↑ The combination of both factors shows that, according to CC, the NC restriction shall at least not only be interpreted from a user-related perspective. The CC FAQ state: “Please note that CC’s definition does not turn on the type of user: if you are a non-profit or charitable organization, your use of an NC-licensed work could still run afoul of the NC restriction, and if you are a for-profit entity, your use of an NC-licensed work does not necessarily mean you have violated the term. Whether a use is commercial will depend on the specifics of the situation and the intentions of the user.” See: https://wiki.creativecommons.org/Frequently_Asked_Questions#Does_my_use_violate_the_NonCommercial_clause_of_the_licenses.3F. ↑ Counter examples would be, e.g. a public museum printing a CC BY-NC photo on a postcard that is sold. In that case the use would be commercial although the institution itself is a non-profit organisation. Whereas, if a company funded a foundation that conducted a project to foster the public health system and used an CC BY-NC photo for the invitation to a conference (which was open to the public and free-of-charge) the use would be non-commercial. ↑ For example, if an employee of a company copies articles that are licenced under CC NC for her colleagues or customers of the company, the use is commercial, since she only uses the material to fulfil her job-related duties. ↑ See chapter 3.4, section b: The CC licences do not apply for uses that are permitted by law. Hence, the licence would not restrict any uses that are legitimate according to limitations or exceptions under the applicable law. ↑ See e.g. the FAQ of the MIT OCP under: http://ocw.mit.edu/terms/#noncomm. The MIT notion of the NC clause is partly more restrictive and partly more liberal than my general interpretation. ↑ Since the interpretation, if any, of the licenser is a relevant indicator for the interpretation of the licence, from the mere legal standpoint it is recommended to follow it. Apart from that, I think that also a moral perspective suggests that the view of anybody, who voluntarily dedicates their creative efforts to the commons, should be respected. ↑ An example: A printed book is directed at a different audience than an online publication. It is marketed through very peculiar distribution channels that are hardly accessible for “outsiders.” If a publisher adopted an eBook that was published online free of charge, the author would in most cases benefit from that. Even if the publisher decided not to share any profits, the author would still benefit from the increased attention and potential rise in popularity. ↑ It is worth mentioning, however, that a dual licencing strategy will not help to differentiate between copies of the work in different qualities. The approach is comparatively widespread as a business model: Image files in low-resolution or low-quality music files are freely shared under NC or other Open Content licences with the intention and belief that the rights in high quality versions of the material are effectively reserved and can therefore be exploited commercially. This strategy is based on a wrong legal assumption. The Open Content licence applies to the work and not to the copy of the work. The work is the photo as the author’s individual creative achievement. That means that if low-quality copies are shared under an Open Content licence, the licence applies also to high-quality copies of the same work. If a user gets hold of a high-resolution copy, they can share it under the terms of the Open Content licence. Some protection of the business model can be reached by making high-resolution copies accessible on sites with limited access and pay walls only. However, this cannot prevent that possessors of high-resolution copies to share them under the Open Content Licence. CC acknowledges this fact, see: https://wiki.creativecommons.org/Frequently_Asked_Questions#Can_I_apply_a_CC_license_to_low-resolution_copies_of_a_licensed_work_and_reserve_more_rights_in_high-resolution_copies.3F. ↑ See in detail: Klimpel. 2013. Free knowledge thanks to Creative Commons Licenses – Why a non-commercial clause often won’t serve your needs, p.12; https://www.wikimedia.de/w/images.homepage/1/15/CC-NC_Leitfaden_2013_engl.pdf. ↑ See, for instance, the explanation at: http://en.wikipedia.org/wiki/Copyleft#Viral_licensing. ↑ See section 1.a. of the legal code: https://creativecommons.org/licenses/by-nc-nd/4.0/legalcode. ↑ The meaning of the term “sharing” is explained in chapter 3.4, section b. ↑ See also the FAQ: “What constitutes an adaptation depends on applicable law, however translating a work from one language to another or creating a film version of a novel are generally considered adaptations. In order for an adaptation to be protected by copyright, most national laws require the creator of the adaptation to add original expression to the pre-existing work. However, there is no international standard for originality, and the definition differs depending on the jurisdiction. Civil law jurisdictions (such as Germany and France) tend to require that the work contain an imprint of the adapter’s personality. Common law jurisdictions (such as the U.S. or Canada), on the other hand, tend to have a lower threshold for originality, requiring only a minimal level of creativity and 'independent conception.' Some countries approach originality completely differently. For example, Brazil’s copyright code protects all works of the mind that do not fall within the list of works that are expressly defined in the statue as 'unprotected works.' Consult your jurisdiction’s copyright law for more information.” See: https://wiki.creativecommons.org/Frequently_Asked_Questions#What_is_an_adaptation.3F. ↑ Again: The CC licence restrictions, such as ND, do no prohibit what is legitimate under the applicable law. In some jurisdictions, remixes and mashups can be published without consent of the copyright owners. This is especially true for the US, where these acts can be legal under the fair use doctrine. However, in present European copyright law no such rule exists. It is therefore unlikely that mashups or remixes are subject to copyright limitations in one of the member states. However, every copyright jurisdiction limits the protection of pre-existing material against its use for the creation of new material to some extent. Under German law, e.g. a creator of a new work can be inspired by existing works. Defining the borderline between modifications that are subject to copyright and “free uses” which are not is therefore considerably difficult. ↑ Whether the collage is allowed under ND depends on the technique applied. If the images are merely grouped together, it is most likely not considered as an adaptation. If they are, however, merged into a new work with an aesthetic expression of its own, it will most probably be regarded as an adaptation. ↑ Parodies of works will often require adaptation. However, many jurisdictions provide a statutory exception for parodies. In that case the ND restriction would not be effective. ↑ It should be noted again that the widespread apprehension that the original creator is associated with modified versions of her work made by third parties is unfounded. As already mentioned, the licence requires anybody who shares adapted versions of the work to indicate that fact. ↑ In relation to this argument, see section E.1.b. ↑ See: . For more information on CC0, see: https://creativecommons.org/publicdomain/zero/1.0/. ↑ Combinations in terms of the chart are such that qualify for adaptations according to the CC licences, see: https://wiki.creativecommons.org/Frequently_Asked_Questions#Can_I_combine_material_under_different_Creative_Commons_licenses_in_my_work.3F. Under this assumption, ND material is always x-ed because it cannot be modified (i.e. not even combined with public domain material). However, also ND works can be combined with otherwise licenced material if the combination is not considered an adaptation (see for the details, chapter 3.5, section b). In general, licence compliance issues arise only in larger works (remixes, mashups, etc.). Mere aggregations (collections) of material are not considered an adaptation. Hence all works can be licenced under their own terms without conflicts unless the works were aggregated on a platform (such as Wikipedia) where according to the platform policy all content has to be published under the same licence. ↑ CC explains the chart as follows: “The chart below shows which CC-licenced material can be remixed. To use the chart, find a licence on the left column and on the top right row. If there is a check mark in the box where that row and column intersect, then the works can be remixed. If there is an “X” in the box, then the works may not be remixed unless an exception or limitation applies.” https://wiki.creativecommons.org/Frequently_Asked_Questions#Can_I_combine_material_under_different_Creative_Commons_licenses_in_my_work.3F. This page was last edited on 20 February 2019, at 14:07.